How do you introduce your character to your reader? 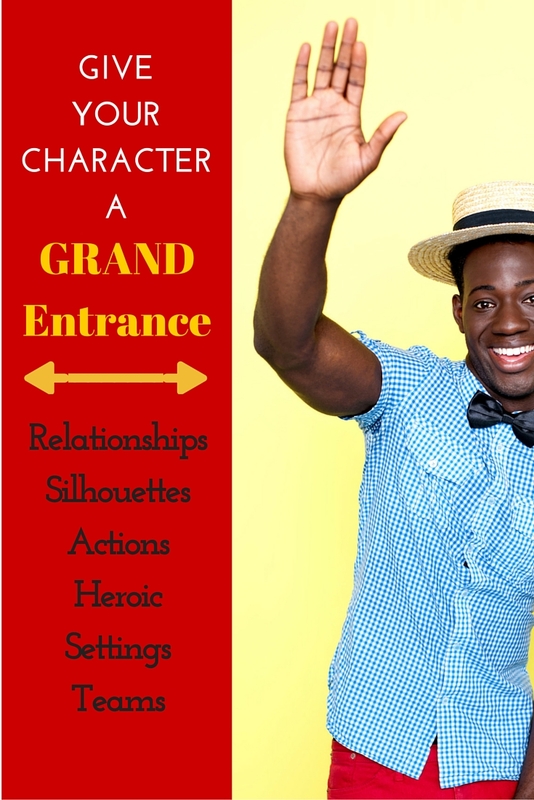 Do you give the character a grand entrance or sneak them in while the reader is focused on something else? A grand entrance signals to the reader that this is a character they should pay attention to. Let’s talk about some ways to make this happen. First, a couple reminders. Great storytelling is built on the foundation of sensory details. When you provide visual, auditory, tactile, gustatory (taste) or actions, the reader becomes immersed in the story as if they were actually present. You can use sensory details to create a zoom, a pan or a scan. A zoom focuses on tiny details; for example, a face fills the entire imagery, with minute details about each feature. The zoom can travel: you may start by describing in detail the character’s shoes and then travel upward to the face. Or start with any significant detail and then pull back to see the whole. For a surgeon, perhaps describe her clever hands and then travel to her scrubs and finally to her face. At the other extreme, a panorama pulls back to a bird’s eye view of an entire village. A scan is a method of handling a crowd scene by using specific details to represent a general sense of the mass. For example, a scan might do a mini-zoom in on an old man stumbling along with a cane, then quickly move to an infant taking tottering steps, and then contrast those with a strong young man pushing everyone aside. The series of mini-zooms gives a flavor of the crowd, making it more specific and thus more interesting. Also, remember that story openings work best when they are focused on a scene. Long-winded descriptions might have worked a hundred years ago, but are less successful for today’s impatient audience. Instead, stories succeed when they start with a character who wants something and faces obstacles to their desires. In short, a scene. With those givens, a grand entrance–the introduction of a main character to the reader–should take place within an active scene. And you’ll have a choice of a zoom, a pan or a scan. Within those parameters, there are other options. In Context of a relationship. The first time we see Katniss in Hunger Games is telling. There’s an opening sequence that sets up what the Hunger Games are, and then there’s a scene cut to Prim screaming. Katniss hugs her, calms her, sings to her. The images are close up, zoomed into Katniss’s and Prim’s faces, as they face the knowledge that the Reaping happens that day. Sometimes the sensory details focus on silhouettes and shadows, often with a blinding light behind the character. Think Psycho (1960) and the silhouette on shower curtain (often parodied). This works well when the character likes to hide in the shadows until it is time to reveal themselves. This works well then timed for effect with a dramatic piece of dialogue. Often, beginning with the character in action makes for a grand entrance. Think of the Bridal March: the audience rises and turns to watch the bride make the long walk down the aisle. Everyone’s full focus is on The Walk. Or think of the Red Carpet arrival of celebrities at a premier or awards ceremony. It doesn’t have to be a Walk, though. For a basketball player, but him on the court and let him score with his signature hook shot. Or show a doctor doing chest compressions as a snow sled skims down a ski slope. Donald Maass, in his Breakout Novel Workbook, asks, “When does the reader first notice the heroic qualities of your character?” As a writer it’s helpful to think about what makes a character heroic in your own eyes. Then ask how you can present that quality the first time the character appears in your story. In context of a setting. Sometimes, the setting is crucial to the story. It may be a space station or a hospital surgery or a swimming hole, but something about the setting is crucial. Here, you could give a short panorama of the scene, and then slowly zoom in to the character and what s/he is doing within your setting. Another option is to scan across a scene (mini-zooms of several people), then abruptly come back for a double take of your character. Group – Team is in Place. Perhaps, the group of characters is just as important as the main characters. In this case, the Team needs a grand entrance, just as much as the main character needs one. Here, you might zoom in on the main character standing alone, and then slowly pull back as one-by-one others join him/her. The focus begins with one character but ends with the group as a cohesive character of its own. Anti-Grand Entrance. For my WIP, I was thinking about all of these options for a major character and eventually rejected all of them. Instead, I slipped my character in on the sly. Jake, the main character, is waiting in the Emergency Room waiting area for his turn to be seen by the doctor. He’s distracted by a huge salt water tank and talks to an older woman who is cleaning the tank. Later, when he goes back to see the doctor, he discovers that the woman cleaning the aquarium is the doctor. This works in my story because one of the themes is hiding in plain sight. Jake dismisses a woman as someone who just cleans aquariums–and reveals things that he wouldn’t normally tell the doctor. It’s a bit of misdirection because Jake makes wrong assumptions. Second Grand Entrance. Another idea to consider for grand entrances is that sometimes, a character needs a second grand entrance, after some life-altering change. In Dicken’s “Christmas Carol,” Scrooge awakens the next morning as a changed man. He walks to the window and throws it open. Ah, what nice imagery. He’s looking out on a new world! He calls to a boy to fetch the large goose and have it delivered to the Cratchit family. This second grand entrance stands in contrast to the first grand entrance of Scrooge and tells the reader that a huge character change has been accomplished. Whatever approach you choose, think hard about the reader’s first impressions of each major character. It is true that first impressions matter. Lots of good “meat” here, Darcy. Thanks for spelling things out point by point, with concrete illustrations. Going to print this one off and save it.